Here's my card for this week's challenge at Global Design Project. I CASEd Connie's pretty floral design, keeping the layout, color scheme, and floral theme in my version. I used a purple on purple floral patterned paper as the base for my design. I recently added Reverse Confetti's The Most Beauty stamp set to my collection and knew that I wanted to make one of the sentiments the focal point of my design. The mix of fonts in this set is so pretty! I stamped the thank you sentiment in plum ink on a cream circle. To set the sentiment off from the floral paper, I adhered a Purple Lacy Scallop Circle die cut to the patterned paper panel, then adhered two trims over the panel. The trims, one a girly ruffled organdy and the other a rougher textured burlap, give the design some texture in a nod to the pleated strip on Carrie's original design.The sentiment panel was adhered on top using foam tape. I accented the panel with a pair of layered purple paper flowers with a self-adhesive pearl at the center. 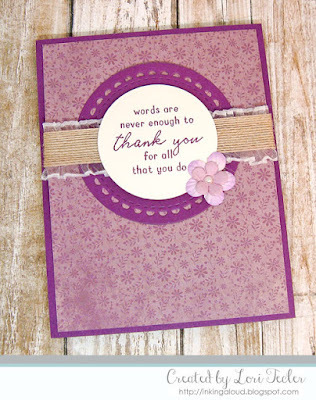 The finished panel was adhered to a card base to match the mat for the sentiment panel. Lori, your card is lovely. You did a wonderful CASE of my card. Thanks for joining in on the challenge this week at Global Design Project.